"We saw also a couple of Zorillos, or skunks... [Félix de] Azara says the smell can be perceived at a league distant; more than once, when entering the harbor of Monte Video, the wind being off shore, we have perceived the odor on board the Beagle. Certain it is, that every animal most willingly makes room for the Zorillo." Every animal may make room for the skunk, except the hapless eternally optimistic dog. Spring on Point Dume is redolent with the scents of acacia, sweet pittosporum, jasmine and, alas, skunk. Here at the Malibu Post, skunk predominates at the moment, because Dog Albert had an encounter with Mephitis mephitis—the garden variety striped skunk, with unfortunate consequences. Both names are certainly descriptive, but somewhat unfortunate, since there’s more to this intelligent, playful, benign and highly successful animal than the weapon it uses to defend itself. But then, the smell is more familiar to most people than the animal itself, which is rarely seen, considering how common skunks are, even in urban areas. Skunks are active throughout the year in Malibu’s mild coastal climate, but they are more evident in spring, when mating and breeding activities bring them into closer contact with humans, cars and domestic animals. This in Oreo, a skunk rescued by the wonderful people at Coast and Canyon Wildlife Rehabilitation, a volunteer, non-profit organization in Malibu that primarily rescues and rehabs squirrels, but is also licensed to help orphaned skunks, like this one. 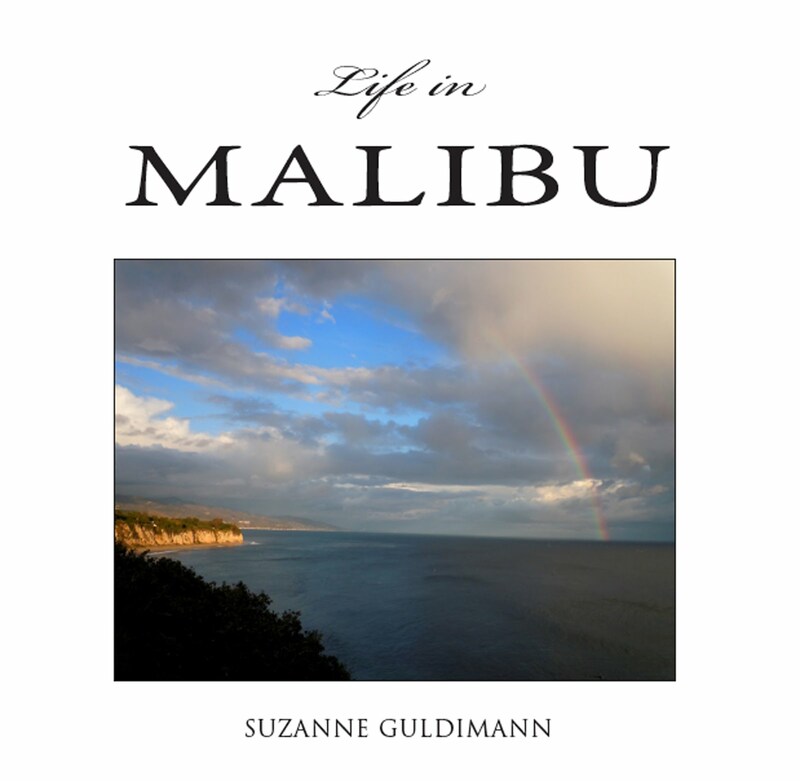 Photographer Kim Barker kindly gave The Malibu Post permission to use some of her amazing Coast and Canyon skunk photos for this article. 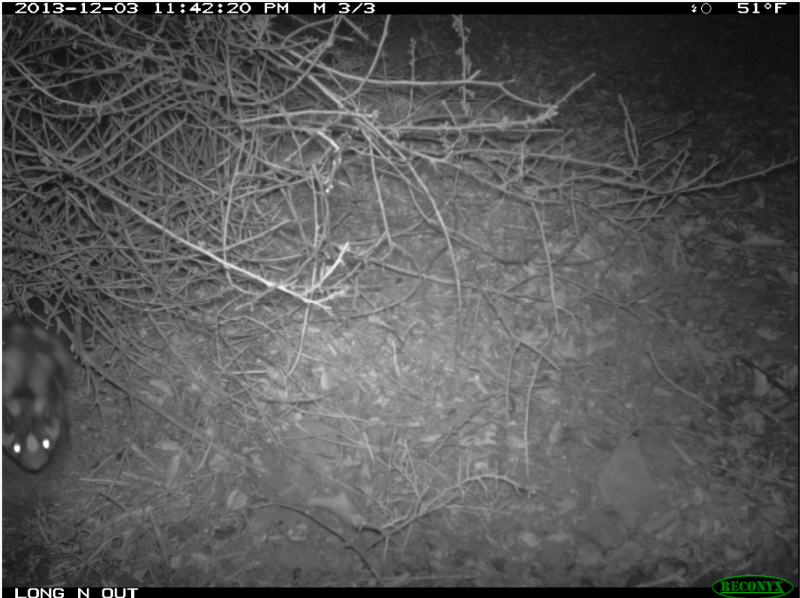 You can see many more at the Coast and Canyon Facebook page. Albert is one of our smarter dogs. This was only his second skunk encounter in the eight years since we adopted him from the Agoura Shelter. I suspect this incident was accidental, he’s alway avoided the neighborhood skunks after that first run-in, unlike his predecessor, who simply could not resist the presence of a skunk, despite the inevitable aftermath. Every Malibuite knows the smell—a terrible combination of burnt rubber, gasoline, rotten eggs and musk that can be smelled a mile downwind, but the stench that fills the house when the shamed and vanquished dog bursts in, frantic to rid itself of the smell by rubbing it on the carpet, the sofa, the bed and his humans, defies description. 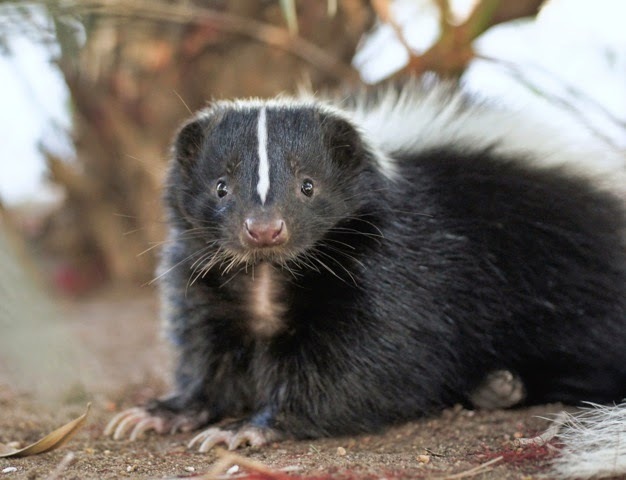 According to a University of Nebraska article on dealing with skunk odor, humans can smell skunk musk in a concentration as low as 10 parts per billion. I can’t imagine what a face-full is like to the many-times more sensitive nose of the dog and it certainly explains why its so difficult to eradicate the smell. 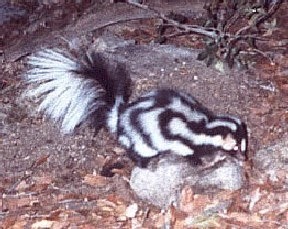 Here's a closer look at the Western spotted skunk, courtesy of Wikipedia. Once upon a time, tomato juice was the folk remedy of choice for dealing with skunked dogs. Bitter experience reveals that this method merely adds tomato stains to the already insurmountable mess. It may turn a light-colored dog slightly pink, but does little to alleviate the stench. Skunk musk is oily and can’t really be washed away without some kind of detergent. The current remedy of choice involves a cocktail containing a bottle of 3-percent hydrogen peroxide, 1⁄4 cup of baking soda, and a couple of teaspoons of liquid dish soap. Theoretically, the hydrogen peroxide and the baking soda help to break down the smelly sulphur-based thiols, while the detergent attacks the oil. Maybe the peroxide we used was old and had lost its virtue, or perhaps we didn’t leave the mix on long enough—Albert, like most dogs, was sprayed in the face, and the musk, yellow against our old dog’s white face, was too close to the eyes to risk leaving the peroxide mixture on for the recommended 10 minutes, but it didn’t do much to reduce the smell on either him or his collar, which we soaked in the stuff. The next round involved assorted shampoos and lots of water, which didn’t do much either, except add a faint scent of lavender to the mix. The final treatment was diluted white vinegar, recommended to me by a skunk rescuer when I was researching one of my first Malibu Surfside News articles back in 2007. This did seem to help. After Albert’s extended bath, the bed clothes and everything else that came into contact with the dog and was machine washable was washed with baking soda as well as detergent. I sprinkled baking soda on the carpet, too, and vacuumed everything thoroughly, and then mopped everything mop-able with more vinegar. 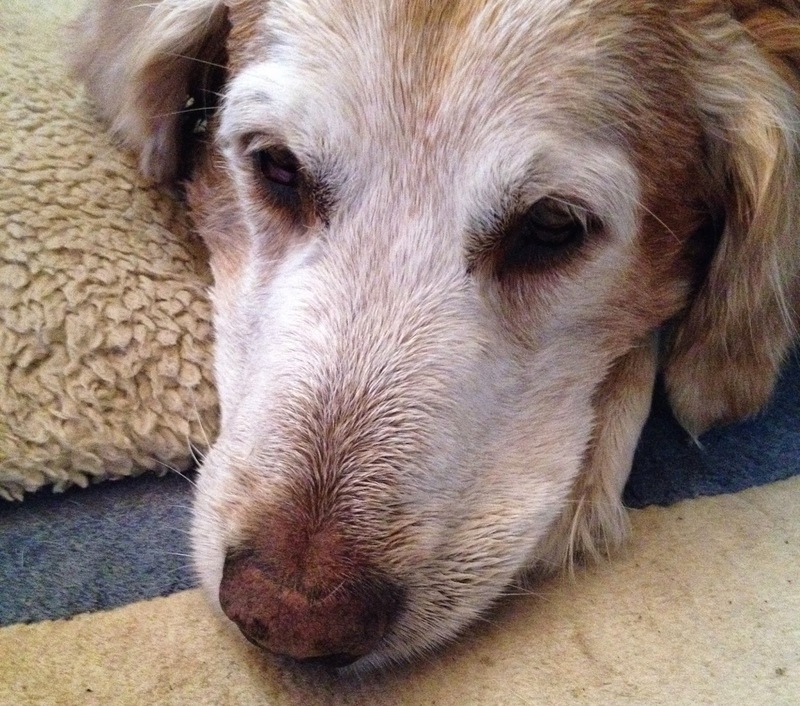 A thoroughly scrubbed and chastened Albert. Unfortunately, I realized that, at some point during the ordeal—probably in the beginning when Albert attempted to climb on the bed—my hair, which is long and unruly, had somehow come in contact with the musk. I had to repeat the de-skunking process all over again on myself this time, and when that was unsuccessful, I took the draconian measure of chopping off three inches from the offending locks. A bunch of tuberose, Spanish broom and jasmine and some old sandalwood-scented incense have helped to mitigate the after effect in the house to an almost tolerable level, although it makes for a very strange combination, sort of like those industrial-strength “designer” perfumes from the 1980s. If the City of Malibu’s name branding campaign ever takes off I now have the perfect recipe for the signature "Malibu Spring Nights" perfume. Albert's skunk successfully made its escape, and Albert is fine now that the initial shock has worn off. It’ll be a long time before the smell entirely dissipates, and time is the only thing guaranteed to effectively eliminate the odor, but its a small price to pay for the opportunity to live in a place where there’s still room for wildlife to live, too, even skunks. Everyone I've interviewed on the subject of wildlife rescue has expressed the firm belief that skunks have an undeserved bad reputation mostly due to that powerful defensive weapon. 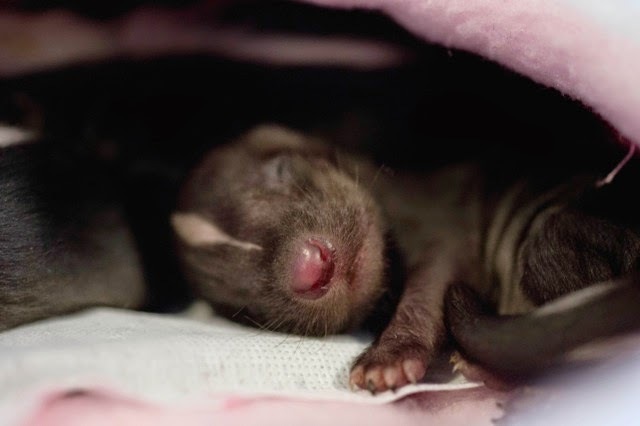 Kim Barker took this photo of a tiny orphan skunk baby at Coast and Canyon Wildlife. It's inconvenient to cope with a skunked dog, but for the skunk, the dog represents a life-threatening hazard. Skunks have few natural predators, but human-created hazards, including dogs, poison, unintentional traps like swimming pools and construction trenches, and especially cars, take a major toll on skunks. They suffer far more from us than we ever do from them. In fact, all of the rehabbers I’ve spoken with have said that skunks are gentle and intelligent. They rarely spray their rescuers or caregivers. And skunk kits are bright, playful and loving. In fact, skunks are beneficial garden residents, as long as humans are willing to take a few steps to coexist. Skunks are voracious omnivores and eat many types of garden pests, including slugs, snails, beetles, grasshoppers, wasps, bees, grubs and even small rodents such as mice. Skunks have even been known to eat gophers, rats and the occasional small rattlesnake. Skunks are crepuscular animals that prefer to be active at dawn and dusk, but they will sometimes venture out during the day, especially when food is available. Albert’s skunk was probably on its way home. The encounter happened not long after sunrise. Skunks have a taste for fruit, bird seed, pet food and garbage. The best way to minimize contact with skunks around the house is to make sure they don’t have access to any of these things. Feeding pets indoors, making sure that garbage containers are closed, BBQ grills are clean and secure, and that fruit from garden trees isn’t allowed to rot on the ground can help. Another key measure is sealing openings under houses and outbuildings—favorite skunk nesting places—after making sure skunks are being shut out, not in. 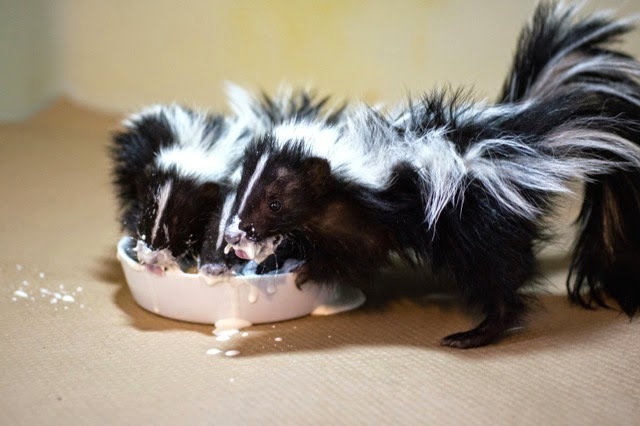 A lively trio of orphaned skunks enjoy a messy meal at Coast and Canyon Wildlife in this photo by Kim Barker. Skunk kits are playful, curious and affectionate. Skunks don’t have very good vision and they aren’t climbers—those impressive claws have evolved for digging up grubs not climbing trees. It's easy for them to get trapped places like light wells, construction trenches or even swimming pools. A branch or piece of scrap lumber makes a good skunk ladder, provided it's not at too steep an angle. A pool sweeper or long-handled broom can be used to gently guide a skunk out of a swimming pool. Skunks also sometimes wander into the house. One of our neighbors was startled to find a wild skunk calmly sharing the kibble dish with the family cat. Fortunately, she didn’t panic and the skunk finished its snack and departed peaceably through the pet door. I had a similar experience while working in my studio with the door open on a warm night. 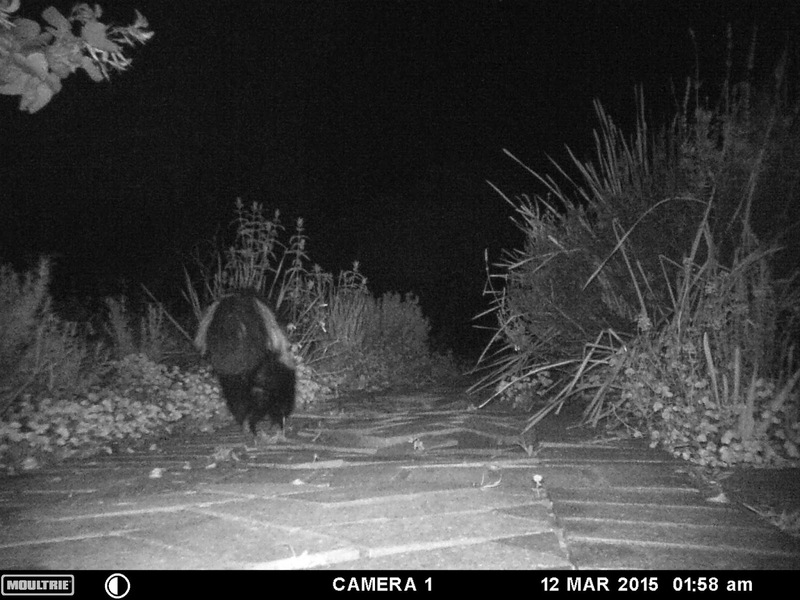 I heard the tip-tap-tip of claws on the tiles and looked up to see, not the dog, but a skunk. Not panicking and not making any sudden movements or noise in an incident like that is the key to avoiding getting skunked. After a tense moment when the skunk and I both went "eek," I held breath and sat perfectly still, and the skunk tip-toed back out the door. Skunks prefer not to get involved in confrontations, and will even do a sort of war dance to warn the potential predator that they mean business. Almost everyone—with the exception of the clueless domestic dog—takes that warning seriously. The skunk communicates with its tail. 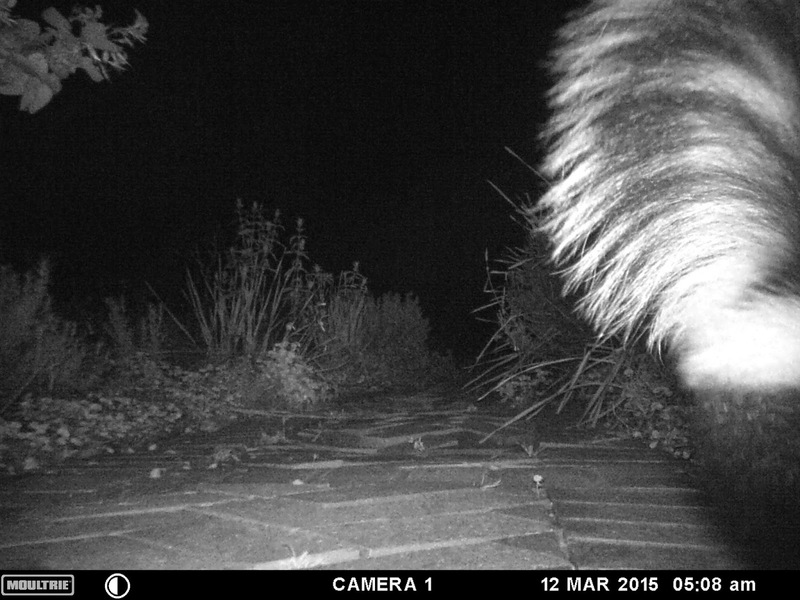 Our backyard skunk appears relaxed and calm in this remote photo, but the tail whips up in the air if the skunk senses something of interest. If there's a threat, the skunk quivers its tail and will even do a warning "dance," stomping its feet to let the potential predator know it means business. Here's a YouTube video of a baby skunk stomping a warning, and a fantastic remote camera sequence showing a skunk scaring off a coyote without having to fire a shot. The great horned owl is just about the only predator that doesn’t mind the smell. Rumor has it one can sometimes detect the otherwise silent flier by the tell-tale whiff of skunk musk. Humans are skunks' biggest nemesis. The weapon that protects the skunk from almost everything else isn’t effective against cars. Poison also takes a serious toll, as it does with so many other species, including ultimately humans. Malibu residents can help prevent skunk encounters and fatalities by slowing down and using extra caution when driving at dusk and dawn. Keeping dogs in at night and on leash during walks can also help. So can installing screen doors and securing pet doors before dusk. It's also a good idea to take a quick look at the garden before going out or letting the dog out. Hasty humans also occasionally end up on the wrong side of a skunk. We are very fortunate to have two wildlife rescue organizations in the area that can handle skunks. Anyone who encounters an injured or orphaned skunk is encouraged to contact the California Wildlife Center for assistance, www.californiawildlifecenter.org. Coast and Canyon Wildlife is a smaller facility and focuses primarily on squirrels, but is also able to care for skunks. Both organizations operate on donations and always need contributions, especially during peak rescue season in the spring. Skunks are a key part of the local ecosystem, along with all of the other local wildlife species—everything from mountain lions to dusky-footed wood rats, and an important part of what makes Malibu remarkable. It's worth making the effort to protect, preserve, and coexist, even when the experience isn't always a bed of roses.